BAKEHOUSE Ferguson Plarre has evolved from two family-owned bakeries into a successful franchise operation with 75 outlets. But chief executive officer Steve Plarre says it hasn’t been an overnight success for the third-generation business, founded more than 100 years ago. “Seventy five stores over 115 years is slow growth but we have gone from 55 to 75 in five years,” he said. Mr Plarre said while some franchise systems have gone from boom to bust, the business has focused on clear values with the aim of handing the operations on to the fourth generation. He said they have hit a sweet spot between rock star pastry chefs and supermarket offerings. Mr Plarre and brother, Michael, took over from father Ralph, in the past couple of years. Started in Melbourne’s north, the two bakeries run by the Ferguson and Plarre families started sharing kitchen space when the Ferguson family outgrew its space. By 1980 the businesses had merged and in 2012 the Plarres bought out the Fergusons, keeping the name. Mr Plarre said the franchise, which retained its third place overall in this year’s Topfranchise Award, ranked highly for marketing, branding and expansion. The awards, managed by 10 Thousand Feet, are based on anonymous feedback from franchisees who give feedback across six areas. Michael and Steve Plarre are the third generation running Ferguson Plarre. He said they sought to be the best rather than the biggest bakery. Mr Plarre said feedback from franchisees was important in shaping the brand’s future. Head office worked hard to provide support to franchisees and the business was always looking at innovation to bring down prices for some goods without taking away from the quality, he said. 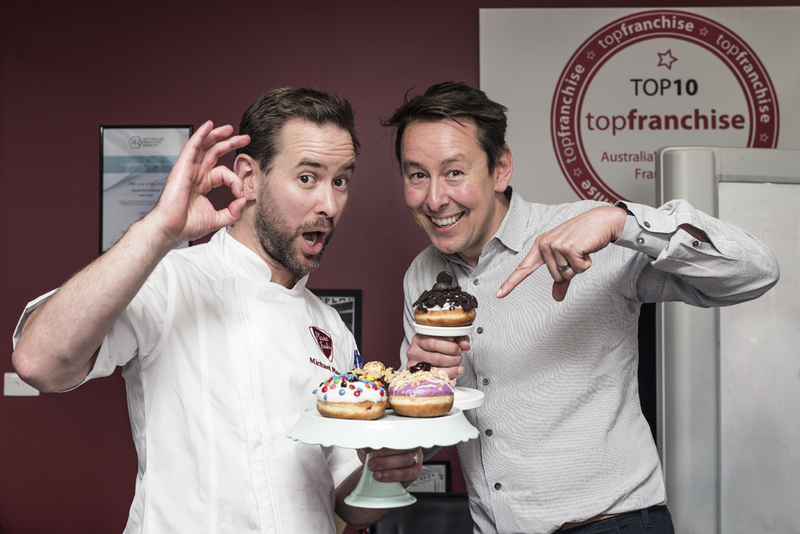 A trip to Europe has inspired the business to roll out a new range of doughnuts including a pop-up store in Frankston’s Bayside shopping centre. “We think doughnuts still have about five to 10 years to go,” Mr Plarre said. He said they had brought back new cake cutting tools and new cookie cakes, enabling letter-shaped cakes, were a big hit. “We might be 115 years old but we are always kicking around new ideas,” he said. Looking for a simple meal to share with friends and family? This delicious recipe makes a perfect meal for 4 people, ready in just 20 minutes. 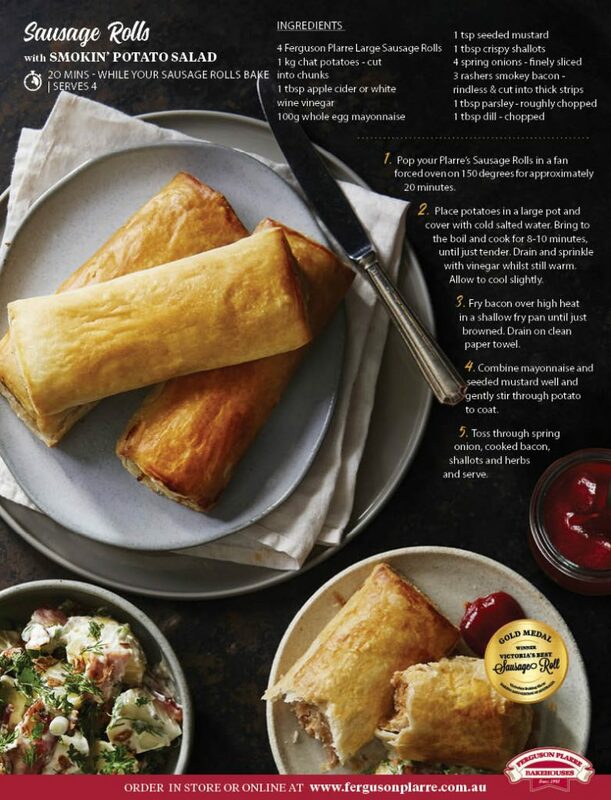 Our Sausage Rolls are made with premium beef sausage mince and golden pastry to create Victoria’s best sausage rolls! They are perfect when served up with our Smokin’ Potato Salad. Place potatoes in a large pot and cover with cold salted water. Bring to the boil and cook for 8-10 minutes, until just tender. Drain and sprinkle with vinegar whilst still warm then allow the potatoes to cool slightly. Combine mayonnaise and seeded mustard well then coat the potatoes with the dressing. 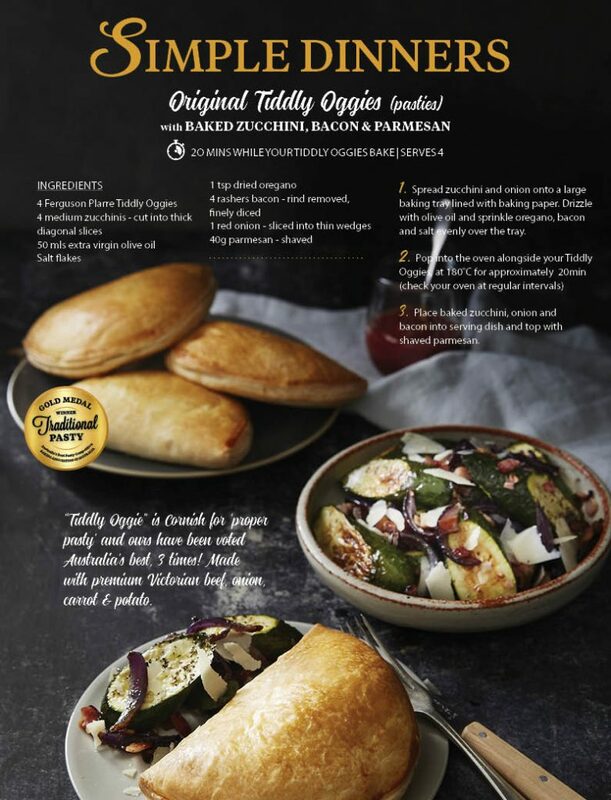 Tiddly Oggie is Cornish for ‘proper pasty’ and ours have been voted Australia’s best, 3 times! 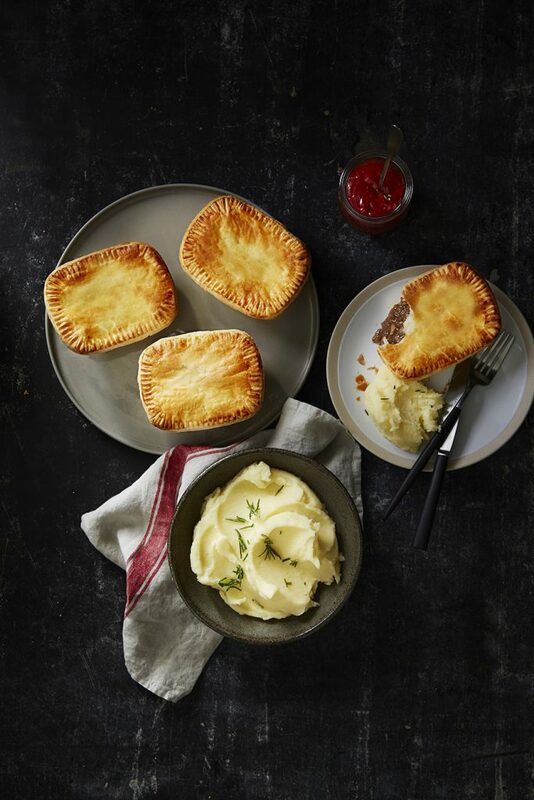 Made with premium Victorian beef, onion, carrot & potato. 1. Spread zucchini and onion onto a large baking tray lined with baking paper. Drizzle with olive oil and sprinkle oregano, bacon and salt evenly over the tray. 3. Place baked zucchini, onion and bacon into serving dish and top with shaved parmesan. Bring potatoes to the boil in a medium saucepan with salted water until tender. 2016 marks 115 years of baking for Ferguson Plarre Bakehouses and to celebrate this landmark achievement one lucky Guest has the chance to win a Birthday Cake every year for the rest of their life. The Birthday Cake competition has now ended! 2016 marks 115 years of baking for Ferguson Plarre Bakehouses and to celebrate this landmark achievement we’re giving one lucky Guest the chance to win a Birthday Cake every year for the rest of their life. Information on how to enter, redeem/claim and the prizes form part of these Terms and Conditions. Participation in this promotion is deemed acceptance of these Terms and Conditions. The Promoter is Ferguson Plarre Bakehouses Pty Ltd, ABN 16 873 899 582, of 35 Harrick Rd, Keilor Park VIC 3042 (“Promoter”). Entry is only open to residents of the State of Victoria (Australia) aged 18 years or older – Winner must be able to pick up their Birthday Cake from their local store within Victoria. Employees and immediate family of employees of the Promoter or any franchisee of the Promoter are ineligible to enter. Immediate family means any of the following: spouse, ex-spouse, de-facto spouse, child or step-child (whether natural or by adoption), parent, step-parent, grandparent, step-grandparent, uncle, aunt, niece, nephew, brother, sister, step-brother, step-sister or 1st cousin. FACEBOOK PAGE – by visiting and liking the Promoter’s Facebook Page at facebook.com/Ferguson.Plarre (“Facebook Page”), follow the prompts to ‘like’ the Facebook Page (if not done so already), access the ‘Win a Birthday Cake’ promotional application, input the requested details as prompted (first and last name, valid email & closest Ferguson Plarre) and submit the fully completed entry form before 5:00pm AEST on 4 September 2016. WEBSITE HOME PAGE – by visiting the Promoter’s website, www.fergusonplarre.com.au, follow the prompts to visit the competition page and input the requested details as prompted (first and last name, valid email & closest Ferguson Plarre location) and submit the fully completed entry form before 5:00pm AEST on 4 September 2016. Only 1 entry per entrant by each entry method is permitted (a maximum of 3 entries per entrant in total). Multiple entries using an entry method will be deemed invalid. The promotion commences on 04/08/2016 and ends at 5:00pm AEST on 4 September 2016. Entries that are in the Promoter’s reasonable opinion: incomplete; indecipherable; or illegible will be deemed invalid. There is one (1) prize to be won in this promotion. 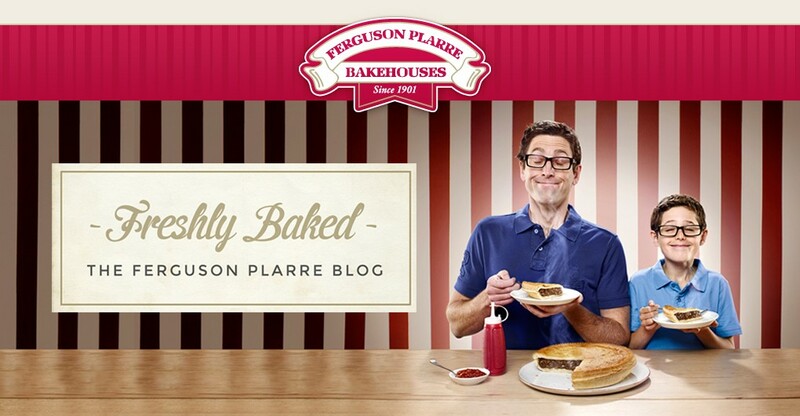 The winning entry determined in accordance with these terms and conditions will win a Ferguson Plarre Bakehouses birthday cake every year for the rest of their life. This prize is non- transferable and can only be used by the winner once per year for the winner’s birthday. This prize is valued at $100 per year (Total projected value – $10,000 based on 100 years) and will be delivered in the form of a redeemable card. The provisional winning entries will be drawn at the Ferguson Plarre Bakehouses Head Office, 35 Harrick Road, Keilor Park, Vic, 3042 at 10am (AEST) on 16 September 2016. All valid and eligible entry drawn by the Promoter will be recorded in the order drawn. The provisional winner will be contacted by email between 10.01am and 11am AEST on 16 September 2016. If the provisional winner does not respond to the email within ten days or otherwise cannot be connected, then that provisional winner will be invalidated and we will call the next drawn provisional winner who will be required to respond to the email on the terms outlined above. This process will continue until a provisional winner responds to the the email. Once a provisional winner responds to the email, they will become a confirmed winner and will be awarded the prize, subject to their agreement for any responses to be recorded and broadcast in any media (and any number of times) as determined by the Promoter (including on a radio station/s). If the provisional winner refuses to have their response email recorded, their entry will be invalidated and the winner determination process will continue until a winner is confirmed. The confirmed winner will be published at fergusonplarre.com.au and on Ferguson Plarre Bakehouses facebook page. The confirmed winner must notify the Promoter of their date of birth before the Prize can be awarded to them. To redeem the prize each year, the winner must contact the Promoter’s head office at least three weeks before their birthday each year to organise their cake. Prize value cannot be transferred into any other products and must be used for one (1) birthday cake up to the retail value of $100. Should the winner desire a birthday cake with a retail value of more than $100, then the prize can be used to reduce the retail price of the birthday cake by $100. If for any reason a winner does not redeem the prize in any year by contacting the Promoter at least 3 weeks before their birthday, then the prize for that year will be forfeited. If in any year the prize is unavailable, the Promoter, in its discretion, reserves the right to substitute the prize with a prize to the same value. The prize will automatically lapse upon the death of the winner. If during the lifetime of the winner, the Promoter ceases to carry on a business of manufacturing or selling birthday cakes, then the prize will automatically lapse, and the Promoter will not be obligated to provide any replacement or substitute prize. Except for any liability that cannot by law be excluded, including the Non-Excludable Guarantees, the Promoter (including its respective officers, employees and agents) is not responsible for and excludes all liability (including negligence), for any personal injury; or any loss or damage (including loss of opportunity); whether direct, indirect, special or consequential, arising in any way out of: (a) any technical difficulties or equipment malfunction (whether or not under the Promoter’s control); (b) any theft, unauthorised access or third party interference; (c) any entry or prize claim that is late, lost, altered, damaged or misdirected (whether or not after their receipt by the Promoter) due to any reason beyond the reasonable control of the Promoter; (d) any variation in prize value to that stated in these Terms and Conditions; (e) any tax liability incurred by a winner or entrant; or (f) use/redemption of a prize. If entering via the Facebook Page, entry and continued participation in the promotion is dependent on entrants following and acting in accordance with the Facebook Statement of Rights and Responsibilities, which can be viewed at facebook.com/terms.php. I love taking our kiddies to Beckett Park in Balwyn Vic. There is plants of gorgeous shady spots in the Maranoa gardens to eat and admire the flowers, the kids love the huge playground, and we all love climbing the tower. I always feel like I am on top of the world. Plus…..it is very close to the Ferguson Plarre Bakehouses store in Balwyn where we get all of our picnic treats!! The grounds of Melbourne University are stunning! I first found them when we had our wedding photos there and I fell in love! So beautiful, tranquil and we’ve created so many wonderful memories there! Melbourne’s Royal Botanical Gardens has so much to offer and explore. The kids also like to end the day by dropping into the Art Gallery, before heading home on the train. It’s hard to find waterfall, especially one like this, its big and beautiful! and very easily accessible, makes it well worth visit!! Most of all its in a beautiful part of Victoria (and beautiful part of the country too). After having a look from the top of the view point we took a walking track all the way to the bottom of the waterfall were the view was even better. Lysterfield Lake is a favourite of ours – lush bushland, great walking tracks, and the tranquil lake! Lake Pertobe in Warrnambool is absolutely amazing and so many activities for the whole family. Of course, a picnic isn’t the same unless you have lots of delicious treats for yourself and the family. Your local Ferguson Plarre will have lots of pies and cakes to offer, but why not take the stress out of your picnic and look at a party catering pack, packed with sweet slices, yummy pies and freshly made wraps & rolls. There are not many foods that can brighten up your day more than a cake, but we think we may have found a cake that goes one step beyond. Our decorating team have waved their magic wands and created a range of amazingly colourful, multi layered rainbow cakes! Up the ‘wow’ factor with one of our bright rainbow cakes – Perfect for birthdays, special occasions and just about any time you want to add a splash of colour to your party! This amazing cake isn’t as complicated as it looks, but if it’s still a bit intimidating then why not simply place an order for one from our stores. They are available until Easter Sunday. Click here to order a Rainbow Nest Cake or a Easter Bunny Burrow Rainbow Cake. If you fancy giving it a try for yourself, we spoke to our head decorator Maria, who told us exactly what you need to do to to create a rainbow cake. So, once you’ve got your ingredients ready you’re good to go. Here’s is what you have to do next. Working quickly, weigh the mixture into another bowl to work out the total weight, then weigh exactly half the mixture back into the mixing bowl. Pick 2 of your colours and stir a little into each mix. Keep going until you are happy with the colour – the colour of the batter now will be very similar to the finished cake, so be brave! Scrape the different batters into the tins, trying to spread and smooth as much as possible – but try not to waste a drop of the batter – a rubber spatula will help you. Bake on the same oven shelf for 12 mins until a skewer poked into the middle comes out clean. Gently turn the cakes out onto a wire rack to cool. Wash the tins and bowls thoroughly, and start again from step 1 – this time using another 2 colours. Then repeat once more to get 6 sponges, all of different colours. Leave them all to cool. Of course, if all of that sounds too difficult and you find yourself running out of time, why not pay a visit to your local Ferguson Plarre or go online and order a Rainbow Cake. They are available until Easter Sunday. Click here to order a Rainbow Nest Cake or a Easter Bunny Burrow Rainbow Cake. We recently had a chat to one of our fantastic team members, Bree Druzca, co-owner and operator with her Mum and Dad, Val & Peter at Ferguson Plarre Bakehouses – Officer. Join us as we step behind the counter to meet Bree, learn about her family, her background and what wild and wonderful experiences she has encountered in-store. So Bree, you’ve been with Ferguson Plarre Bakehouses since 2013. What was your first experience of Ferguson Plarre? “Actually, I got into Ferguson Plarre quite late in life. I’m 29 now and the first time I visited Fergies was when we went for a drive as a family when we were considering whether to get involved with Ferguson Plarre as a business. That’s some very tasty research that you’ve carried out there – What actually made you decide to build a business for yourselves? “My parents have always had their own business for as long as I remember and I really don’t know much different. Before starting at Ferguson Plarre I was working for another company and while it was great, there is something really very satisfying about building your store and business from the ground up. What do you love about working at Ferguson Plarre? “One of the most enjoyable parts of coming in for the day is seeing our regulars. We have a number of guests that come in 4 or 5 times a week – We make sure we know their orders off the top of our heads so that all they need to do is take a seat and your coffee and cake is sitting in front of you almost immediately. What does a typical day for you look like in store? “Well, I get up most days at 5-30am, then head off to the store at 6am for a 7am opening. As soon as I get in the coffee machine is fired up and of course I have to try the coffee to make sure it all tastes perfect – that caffeine shot comes in handy around 8-30am when the morning rush starts. As soon as the coffee machine is firing on all cylinders we start to move our beautiful cakes from the fridge to our refrigerated cabinets so that everyone can see what we have available each day. 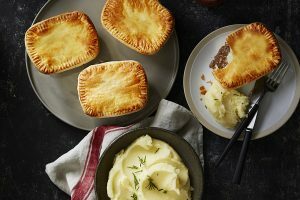 At the same time we also start to put a few of our more popular morning pies in the oven so that they are ready for those who are looking for a savoury brekkie on the go. So that is a typical day, but what about some of the more unusual days. Are there any funny stories that you can share with us? And there you have it, Bree Druzca from Ferguson Plarre Bakehouses – Officer is living proof that family businesses are a great asset not just to the families themselves but also the community. We know that Bree, Val & Peter will continue to grow and evolve with their community and no doubt be local icon for years to come.